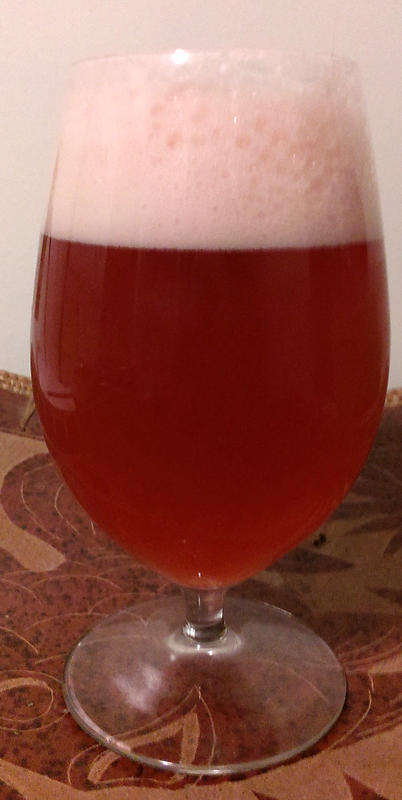 A few weeks ago I blogged a recipe of a Christmas-themed Gose that I was brewing – flavoured with hibiscus, orange, cranberry and cinnamon, this was intended to be a unique Christmas beer for my winter enjoyment. So its time for some tasting notes. I knocked this f***er out of the park. Hell, this may be the best kettle-soured beer I have ever produced. Appearance: Red. The beer pours with a distinctive red coloured body; not the red of a melanoidin-rich barely based beer, but really really red. Crayon red. The wheat portion of the beer makes itself apparent in the haziness of the beer; combined with the red colour the effect is unexpected and visually pleasing – sadly, my shoddy camera work doesn’t do it justice. The head itself is white with tinges of pink. Its highly carbonated, so the head pours thick and fine, and lasts for most of the pint. Aroma: The cranberries dominate the aroma, with their unique sharp fruit character, along with a notable lactic aroma, shining through. Behind that is the sweet/berry aroma of hibiscus, a slight bready character, and a hint of yeastiness. Flavour: This is where this beer shines. Up front is a bracing lactic sourness. The “tang” of the cranberry works alongside this, creating an overall “sourness” far more complex than what you normally get with a kettle sour, and yet retaining the clean sour profile that characterizes kettle soured beers. The hibiscus really acts to balanced this acidity through providing a sweet note – some sort of unfermentable glycoside, I assume – along with emboldening the fruit character provided by the cranberries. The orange plays a minor background role, giving a subtle orange-zest character noticeable mostly in the aftertaste. It took a number of test batches to dial-in the salt level to a level I like – and its perfect for this beer. The salt is present, but subtle. It acts more to tie the flavours together and to mellow the beer; the taste of salt is present, but mostly as a flinty character rather than an overt saltiness. The only thing missing is the cinnamon. 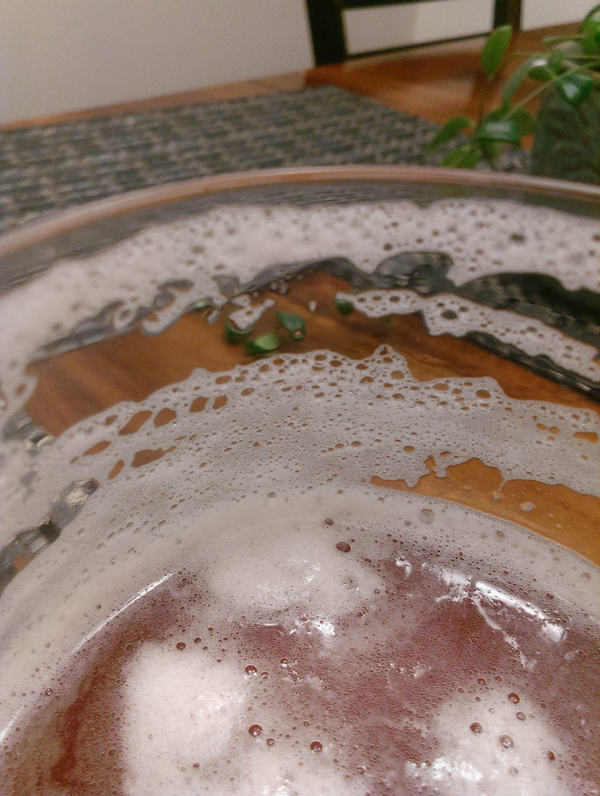 But given how wonderful the beer turned out, its absence is a blessing rather than a flaw. Mouthfeel: Complex is the best description I can give. The beer was brewed to have a light body and be highly effervescent – and it is. The low finishing gravity combined with high carbonation and acidity creates a prickly, light mouthfeel on the tongue, especially as the beer enters the palate. But the salt works in opposition, rapidly adding a fuller, more meaty mouthfeel as the effervescence fades. The aftertaste is a mix of hibiscus sweetness/fruitiness, cranberry “tang” and lactic sourness, and fades in a way which leaves you wanting more. Overall: If it isn’t apparent already, this is a damned good beer. My second-best of the year (#1 to be blogged about soon), likely my best kettle-soured beer of all time, and in all honesty, one of the better sour beers that I’ve made recently. What it lacks in traditional sour-beer complexity is more than made up for by the interplay of the hibiscus, cranberry, acidity and salt. It is eminently drinkable, and yet, complex enough to be enjoyed slowly in front of a Christmas fire. There are four minor tweaks I would make upon re-brewing: 1) drop the cinnamon completely, 2) increase the hibiscus by 20-30%, 3) use the zest of an additional orange (3 instead of 2), and lastly, 4) brew a double, triple, or even quadruple sized batch. Because there’s no way any of this beer will be left by Christmas! ← Easy Home Yeast Banking – and a Video! Had this beer during our November guild meeting.. truly amazing beer Bryan. I found everything to be in balance, yet it was complex and extremely drinkable. Your review does it justice. I need to brew this to have on tap in the spring. Congrats on the brew. I hope it does well in your homebrew club contest. It would be great if you would share the thoughts of this beer that you get from the club members.